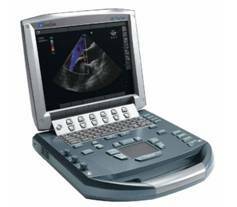 SonoSite is a well-known leader in the ultrasound field, and the M-Turbo ultrasound machine is no exception. The main focus of the M-Turbo’s cutting-edge design is portability above and beyond anything else on the market today. It is engineered for durability and adaptability, ensuring consistent performance and reliability. With proprietary technology and unsurpassed vision, the M-Turbo has become the most desired portable hand-carried ultrasound equipment currently available. The M-Turbo ultrasound machine is known for its robustness. In addition to surviving a Drop Test at three feet, it has a protective magnesium case and fluid-resistant keyboard. When emergencies threaten, the M-Turbo rises to the challenge with a rapid boot-up system and wide range of transducers and applications. It handles data management with ease and is PC/MAC friendly, in addition to having two USB ports for easier access. It boasts wireless and DICOM capabilities, and employs a multi-beam advanced needle visualization tool. Similar systems to the M-Turbo include the GE Vivid e, Acuson Cypress.